Kayaking on the open water, world-class concerts under the stars and hiking and hammocking around hidden wooded gems make The Woodlands a summertime must for vacationing nature lovers and live music fans. 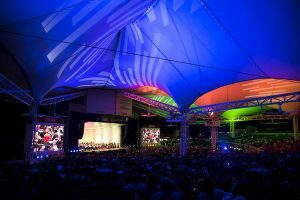 At The Cynthia Woods Mitchell Pavilion, one of the world’s most popular outdoor concert venues located in the heart of The Woodlands, music fans enjoy live performances from some of the biggest names in music. This summer’s schedule is packed with the likes of John Legend, May 21; Jimmy Buffett, June 8; Boston, June 12; Future, June 22; and John Mayer, August 6. Enjoy the concerts from reserved covered seating or from open seating on the lawn – either way, the Pavilion is the perfect spot to enjoy your favorite artists. For a complete list of summer concerts at the Pavilion and ticket information, go to www.woodlandscenter.org. 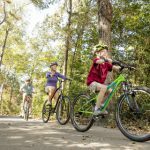 Add to the excitement of your visit by staying in one of The Woodlands’ brand new hotels – The Westin The Woodlands and The Embassy Suites by Hilton at Hughes Landing. You can also find outstanding accommodations at The Woodlands Resort with its Forest Oasis Waterscape, lazy river, all-new guestrooms and on-property, championship golf; the sophisticated, four-diamond Hyatt Centric Market Street boutique hotel; The Woodlands Waterway Marriott Hotel & Convention Center, another four-diamond property; Hyatt Place and several other name-brand hotels, each minutes from The Woodlands Town Center. Those looking for something more active can get up close to nature at the George Mitchell Preserve, a lush forested setting with a two-mile main hiking trail loop and three miles of bike trails. Or if you’re looking to kick back and enjoy the forested views, bring your own hammock and swing from a tree with friends. Hammocking has emerged in popularity in recent years as a way to relax, reconnect with friends and nature and get away from the technology and information overload of daily life in the modern age. All you need is a hammock and two trees to make the most out of your experience at the George Mitchell Nature Preserve. Don’t forget to bring some snacks to eat while you swing! 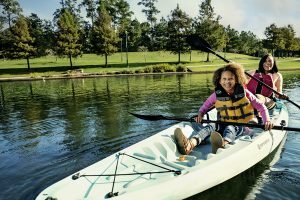 For fun on the water, head to the Riva Row Boat House where single kayaks, tandem kayaks and paddle boards are available for rent on The Woodlands Waterway. Kayak along Lake Woodlands and enjoy the views or catch a paddleboard yoga class and challenge your balance. Paddleboard yoga is taught by a certified yoga instructor. The two hour class begins with safety, learning about your board and how to paddle. Then, the class is guided out onto the lake for a 1 hour Vinyasa flow before heading back to the boathouse. Dates for the summer are to be determined!